The last time I had a bunch of carrots clogging up my fridge I decided to make soup, adding cloves to it because that’s what I had read in a blog. The result was edible, but seriously underwhelming. I actually still cringe at the thought of it. Why did I not stick with a tried-and-tested-combo such as coriander and ginger? Well people, I am doing the hard work for you here. Don’t make carrot soup with cloves. Unless you really, really like cloves. When I checked my fridge today and saw the three bags of carrots in the vegetable compartment (why did I think I needed three bags?! ), I could still taste that darn carrot soup. It had to be something else. Something un-soupy. 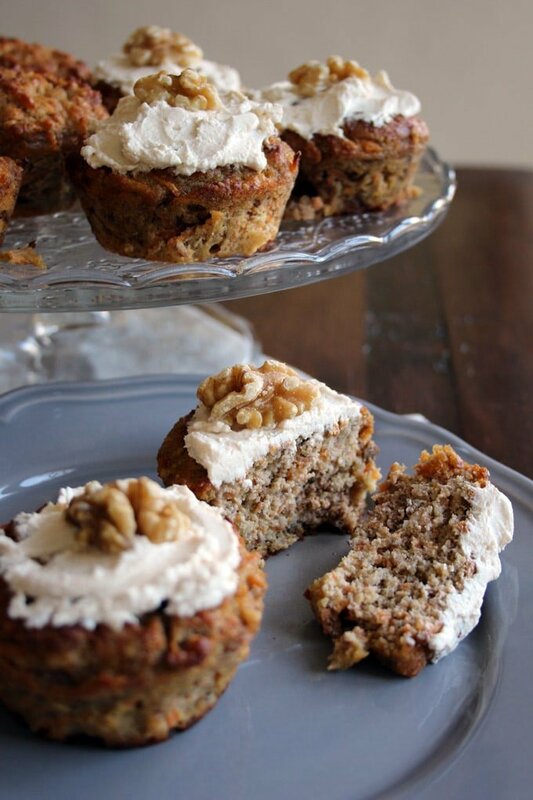 It could only be… healthy carrot cake muffins! Now, friends. You’ve got to take a leap of faith here. For I am telling you, while this recipe is on a blog and online, it is tried and tested. Three times now. By ten people in total, different age groups. At different times of day. Thumbs-up all around! And what’s not to love about these babies? 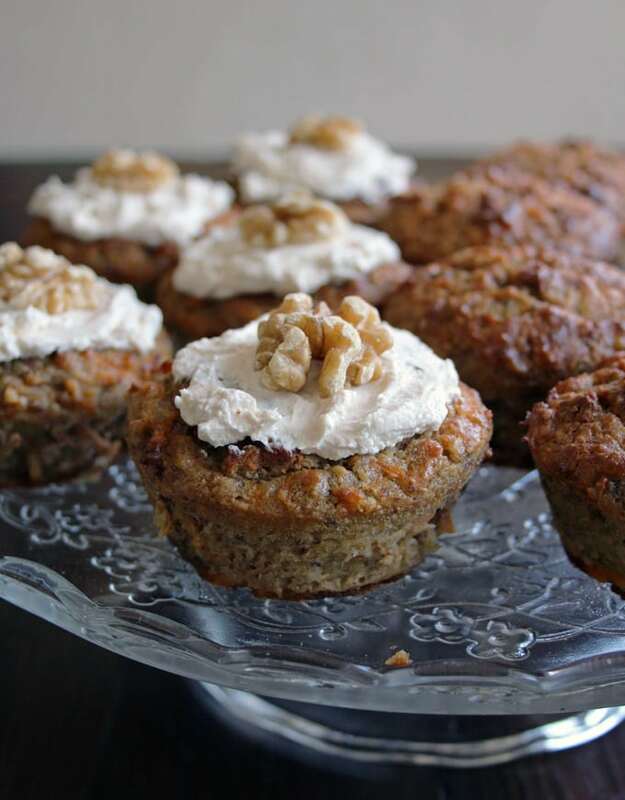 These healthy carrot cake muffins (inspired by Ditch the Carbs’ Low Carb Carrot Cake) have been, as the name cleverly suggests, stripped of anything you could possibly feel guilty about. 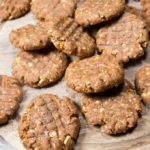 They are gluten free, grain free, refined sugar free and packed with carrots and nuts and would therefore make a legitimate breakfast option! I can vouch they go very well with a cup of coffee. And, in fact, a glass of milk. I have added cinnamon-flavoured cream cheese frosting, but if frosting is not your kind of thing, the muffins taste just as good without. 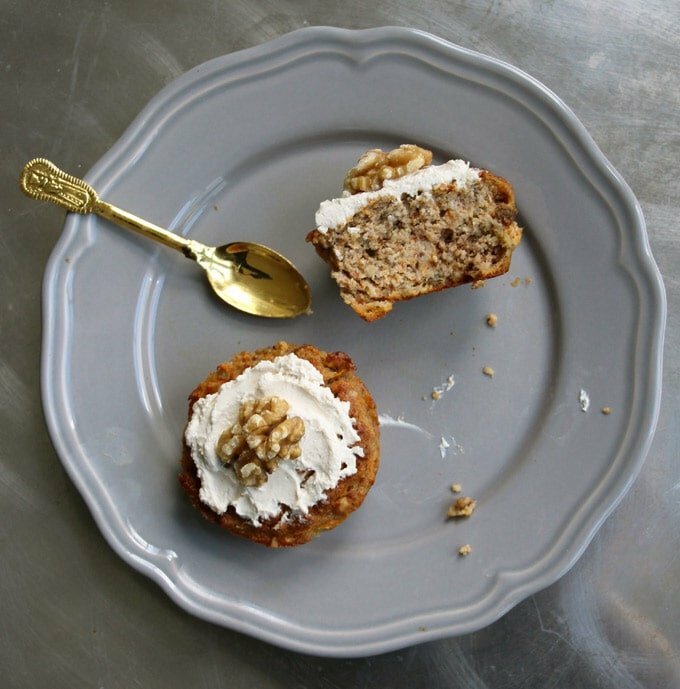 If you like to bake big, this recipe can obviously also be made into a carrot cake – you might have to keep it in the oven a little longer. 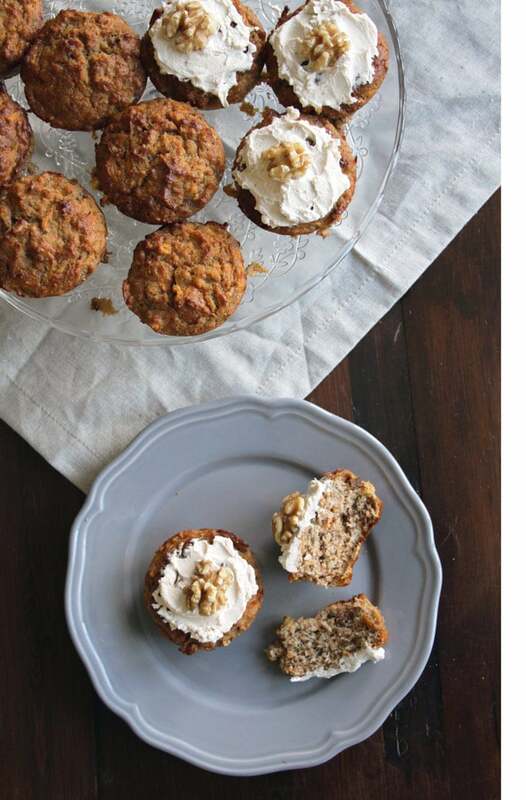 Sensationally moist and nutty: These healthy carrot cake muffins are grain free, sugar free and packed with carrots. An absolutely guilt-free dessert. Blend your eggs, softened butter and bananas until thoroughly combined. Mix in the ground almonds, flaxseed, spices, vanilla, 1 tsp stevia and baking powder. Lastly, gently stir in the grated carrot and the walnuts. Make sure the carrots are grated and not ground to a pulp, which essentially separates the liquid from the fibre. This was the mistake I made in my first attempt! Pour the dough into a well-greased muffin tin or line your muffin tin with paper cups. I use a silicone mould as I find they are the most helpful at getting muffins out in one piece. Bake at 180 Celsius for circa 30 minutes or until nicely browned. Hi, yummy recipe that tastes great. I had one issue that there was lots of butter collecting in the tray underneath my muffin cases. Any idea why this might be? The only change I made to the recipe was to substitute chia for flax. I want to get this sorted out as I want to make them better next time!! You are welcome!!! Kids are always the fiercest critics, so when they say it’s god, it’s GOOD! Hi there, thanks posting this. I’d like to try this recipe in a loaf tin instead of making muffins. Do you think it would hold up well? Hi! I’ve just made these, and while they’re tasty, they almost remind me of an omelette? I used normal gluten free flour (i mainly wanted the low sugar, not too fussed on low carb. Would you suggest adjusting the recipe if I do it this way? I may try it again with one less egg. 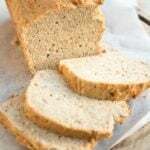 Hello Nikki, recipes with nut flours generally need more eggs than wheat flour recipes. This may be the reason why your muffins ended up “eggy”. I’d definitely use less eggs if you want to use regular gluten free flours. Great, thanks very much! My one year old is loving the first batch though! Perfect for a great breakfast! 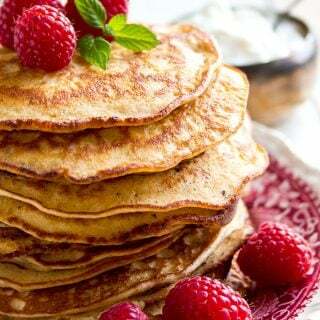 I’ve made these at least 6 times & we love them, I’m thinking about substituting Sukrin Gold (which I learned about in your wonderful Cinnamon Roll recipe) for the Stevia, and am hoping you can suggest an equivalent amount of Sukrin Gold to replace the Stevia please. I’m glad you like the recipe!! The granulated stevia I used was twice as sweet as sugar. So to replace it with Sukrin Gold I’d use 2 tsp in the batter. I wouldn’t use it for the icing though, unless you take a batch and powdered it in a food processor. Or crush 1 tsp with a pestle and mortar. Powdered works just better for icings. Hi, I love all your recipes, I made these carrot cake muffins today and mine are awfully soggy / doughy in the middle? I baked them for extra time as well. Are these meant to be like this? If not I’m not sure what I did wrong, the flavour is nice though. They feel very buttery, maybe I could reduce this. Hi Caroline, I’m so sorry to hear they didn’t work out! I’m wondering why this could have happened – it’s always hard to say when you weren’t there…. maybe you grated the carrots really finely and they were watery? That’s one thing I imagine would definitely make a difference. I find that if I’m using too much fat in something, it tends to collect on the top and does not make the middle soggy. (This happened recently when I tested my Keto brownies recipe and I reduced the butter content for the recipe that made it into the blog). I hope this helps…. Thanks! I used a blender for the bananas and butter and eggs at the start which made them quite watery, maybe I’ll just mix instead. I’m going to try again today because they smelled so good! P.s. 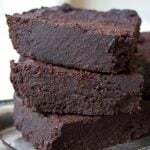 I love the browny recipe! 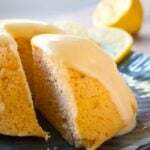 Such a pretty Name love all of your recipes I’m a type 2 diabetic so any recipe of which is no sugar or stevia is so much healthier I love too cook for My Husband and Friends I will be able too eat just one or shhh two lol lol lol. So thank you so much for youre recipes. Hello Jan! I feel honoured… 10 stars is more than I could’ve ever hoped for 🙂 I’m so happy you found my site and thank you for your kind words! 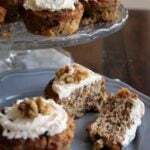 I made these carrot muffins and they cane out so moist and not so sweet, in which I like and it took a few days for my hubby who loves the sweet stuff and carrot cake to eat one, then two. Then he asked if I could make these again to snack on. Next time I’ll make with 1c almond flour to 1/4 c coconut flour. Should I add another egg because of the coconut flour? This is my go to for carrot cravings. Hi Dunia, I’m happy you like the muffins. If you want to sub some of the almond flour for coconut flour, you must change the amount because coconut four is MUCH more absorbent. 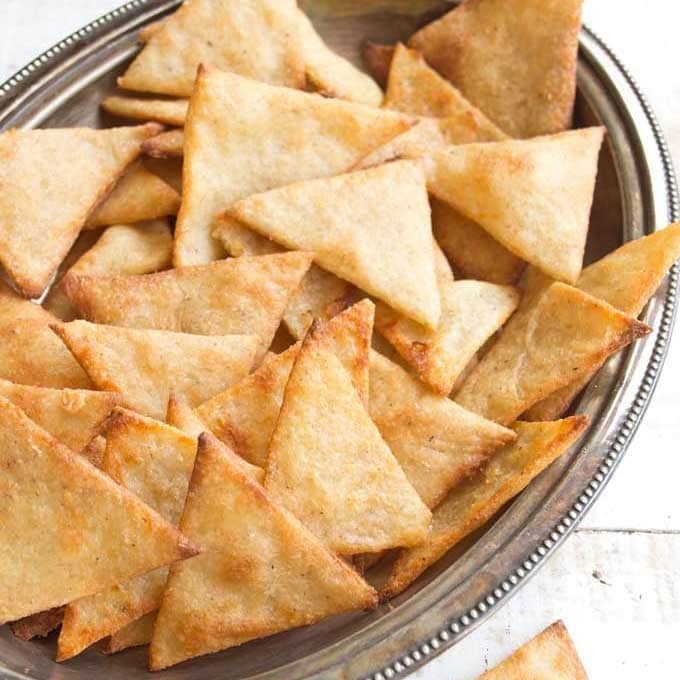 I would recommend using 1/3 – 1/2 of the amount of almond flour, so for 1/4 cup possibly only 1 1/2 tbsp of coconut flour. I do not think you need to increase the amount of egg, 5 is plenty. Hey Katrin, I have been living off of your recipes for the last 6 weeks after finding out I have gestational diabetes. I’m a plonker and was not concentrating when I added the 100g of cream cheese into the mix. Too late to do anything as I gave it a good stir! I’ll let you know the result! Haha, I do that kind of thing all the time. Let me know how it went! 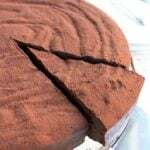 Recipes can be quite forgiving – you might discover that it tastes fantastic! When you say “blend” eggs, butter and bananas until thoroughly combined, do you mean to use a hand mixer or just stir by hand? Am I aiming for a smooth non-lumpy blend that a hand mixer would give? I am diabetic and made your muffins yesterday. My whole family enjoyed them immensely. They had no idea they were eating low carb!!! Hi, I’ve just made double the amount and 12 muffins are baking now! I was going to put the rest into a loaf tin, but have decided to do them all as muffins so easier to freeze! Also, double the amount looks more like 3 times the number of muffins! Weird! AND, I didn’t look at all the messages first and I grated the carrots with the biggest side of the grater, so I’ll let you knoe if they come out too carroty! They smell wonderful, looking forward to a taste. What a good idea to make a double batch. I love having leftovers! Hi Katrin, these muffins look amazing! I was just wondering if I can cook them the day before and add the icing on the day. Would it be better to refrigerated or leave the muffins at room temperature? 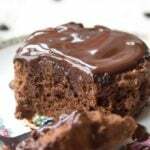 Hi Katrin, this recipe looks delicious! Do these muffins freeze well or are they best to be consumed within days of making? Hi, thanks for asking, to me that was the same thing! As all graters are different, this could be a guideline – the grated (shredded?!) carrots you get in ready-made salads are probably a bit large. Any size below that is fine. Too small would be if the juice starts separating and you more or less have a pulp. Hope this helps! Glad you like the recipe Rachel, and thanks for pointing out about the vanilla. I’ve added it to the description – you just mix it in with the bulk of the ingredients. Thanks for the recipe of the carrot cake, sounds great. You are welcome Karen, this cake always goes down well. Let me know how you get on when you give it a go! Well i made them i had no mixed spice so left that out and replaced the flaxseed with psyllium husk. I had to improvise a lil. When girls get together they over indulge. So im prepared. I have the snacks and these will be a treat let me tell you. Thankyou so much. Who would think healthy vould taste so naughty lol. No icing going on these. Just perfect left plain. You are so welcome Michelle! Sounds like you had a fab time too 🙂 Say hi to the girls!! Just wondering. Do you think you could replace half the carrot with cauliflower at all? Interesting thought. Why not? 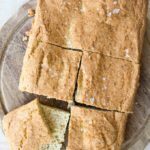 I’ve seen cake recipes around using cauliflower, though I have never tried it. Give it a go and let us know! 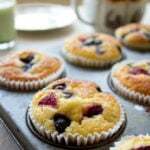 Would love to try these muffins on my husband, who is on a greatly limited diet. Could u convert the metric measurements, into the British Standard, measures we New Yorkers find easier to work with? Hello Lucy, I have updated the recipe so it now includes US measures. Happy baking! Danielle, that means a lot to me. Thank you for this lovely comment! I substituted flaxseed for chia but they came out so wonderfully, and as a type 1 diabetic it was a great way of feeling like I could eat muffins again without feeling guilty! I found they made perfect breakfast muffins to start my day off right and they kept me full all morning. Thank you for a great recipe! What a lovely message, that’s so nice to hear. I’ll have to try them out with chia, that sounds like a great idea. 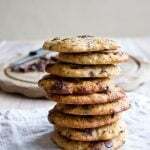 Can I use almond flour instead of grinding my own almonds? What constituents “mixed spice”? Would that be akin to pumpkin pie spice blend here in the US? cinnamon, nutmeg and allspice are the most dominant flavours. Looks so moist! I totally want to try this. Liquid stevia or powdered? Thanks Michelle! Let me know if you try them.